According to Gartner, when it comes to Account Based Marketing (ABM) we have just past the peak of the hype cycle. That means it’s downhill all the way from here, until expectations are readjusted and its true merits discovered once again. At the moment the breathless blogging about its value to business might be sounding a little hollow. 15 Captivating Statistics That Prove You Need ABM Right Now, for example, seems to be suggesting it’s a magic bullet for everyone, which it certainly is not. There is also hype around ‘hands-free ABM’, which is promising effortless, fully automated solutions for what is, in reality, a detailed and complex task of analysis and execution. Still, we’re not in the trough of disillusionment yet, even if in the comments section of a recent marketing blog some jaded Sales Director described ABM as ‘just another way of getting your act together’. In reality, ABM is a highly targeted approach to B2B marketing, which means zoning in on key accounts to create hyper-targeted content and campaigns. ABM should be the perfect marriage of inbound and outbound marketing techniques, delivering personalised experiences to high-value prospects within specific businesses. It’s a fantastic opportunity to cut through to precisely the right people in exactly the right companies. And the stats continue to support its claims to be a successful approach. According to Gartner ABM programs show a 70% increase in opportunities created in businesses where it is used. Other sources cite a 171% increase in Annual Contract Value and 50% reduction in wasted sales time where an ABM strategy is deployed. To succeed ABM requires close collaboration between sales and marketing, as well as specific expertise and effort. There are tools that can help you target and deliver these campaigns. However, it is going to need your specialised knowledge of sectors and clients to deliver the insight and content that will really make it work. The truth is ABM is a fantastic approach for some sales challenges. But it is supposed to augment, not replace a comprehensive, inbound marketing strategy. It’s not a silver bullet, but for companies where lead times are long, deals are sizeable or unusually tricky to land, the intelligent use of ABM can accelerate the sales cycle. With that in mind, you won’t be disappointed by ABM if you approach it in the right way, and if you are realistic about what it can do for you. Are you doing ABM for the right reasons, or just because someone has said you should? Have you got the will, skill and resources to do it properly? Will the reward be worth the effort? Consider the peacock. 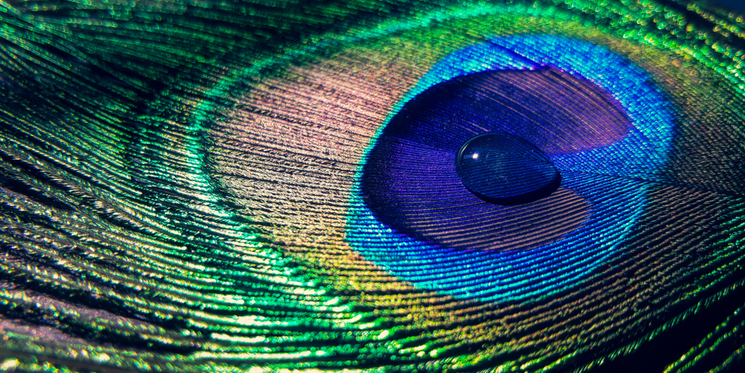 The peacock puts on such a magnificent show with its tail feathers to attract a partner because its chances of successfully mating in its lifetime are just 5%. Tragically, the shortsighted peahen is not good at recognising the male’s advances. For the Peacock, therefore, it’s definitely worth the considerable evolutionary effort involved in creating his specific and compelling display. For some businesses in some sectors, a sales prize may be so great, an opportunity so rare or a prospect so elusive, it will be worth the extra effort to target them. The business won will be sufficiently valuable to justify the time and resource spent developing the tailored messaging that will resonate with them deeply and specifically. Some accounts will definitely be worth going the extra mile for. In some cases, though, ABM will be a sledgehammer to crack a nut. However, although it’s often thought that large corporates with multiple decision makers are the best candidates for this approach, now there’s plenty of evidence to show that SMEs can also be usefully targeted through this method. The solution is proving scalable, and any niche or hard to reach business (given it has sufficient long term value to you) can be worth the effort to approach in this way. Total alignment between your sales and marketing function is key if this process is going to work. There will need to be honesty and transparency on both sides. The sales team needs to be clear about the accounts they want to win and their ability to do so. They need to share everything they know about the selected target accounts as well admitting to gaps in their knowledge. In the same way, the marketing team needs to be up front about what collateral they can create and their ability to work the necessary channels to achieve the right results. You are then going to need to plan meticulously and together. The teams should agree the accounts (or companies) they are going to target and their reasons for doing so. When the target organisations are chosen you need to spend time understanding how the buying cycle works for them. What are the needs of these specific companies? What are the sales opportunities and when do they fall? Who are the gatekeepers and influencers and who are the decision makers? Who, ultimately, holds the purse strings? These individuals may be personas to start with, but they will eventually become known to you as people, and you will need to treat them as such. What social channels do they use? Where and when are they most active on line? What makes them tick? There are tools that can assist you with these tasks, but it is first and foremost a collaborative and a human task. After all, you need to figure out a complex web of personal and business relationships that govern a decision-making process. Make a plan that is flexible and responsive, then concentrate on getting your content right. ABM is a mixture of advanced inbound and outbound marketing techniques. Your plan should let one approach support another in targeting a specific business and the individuals within it. There are tools available to automate its processes, but much of this work will necessarily be manual and bespoke. Is your content good enough to truly cut through? Is it genuinely relevant and resonant for the individual or personas you are focused on? You’re going to need to create a range of content that your prospects will encounter in different ways and in different places: emails, video, infographics, podcasts. You need to build content that contains keywords and messaging that you know will chime with the individuals you want to reach. Personalisation is more than a series of mail-merged emails with a vague mention of having been at the same event with them once. In fact, there is a real art in creating great ABM content. Many specialists recommend name checking target company and prospects within specific pieces like blog posts or online magazine articles. And we’re not talking about shoe-horning people’s names into content, here, but using their success stories, interests and specialisms to show you recognise and respect their expertise. With personalised collateral like this, it’s much easier to get a prospect’s attention. Social media listening teams in large organisations may even pick up on it and deliver it back to the individuals involved; interruptive marketing, but delivered by their own team. Great Account Based Marketing is about making moments like this, where the boundaries between interruptive and inbound become blurred, and one channel can really build on another's success. But ABM will only work as a strategy if its basic principles are respected. If it’s badly planned, implemented haphazardly, or without a clear objective then it really won’t live up to the hype.